*Special info from friends in Middle East.The political vision are not share with the author.The Free Syrian army is a Al-Qaeda « false flag » army.Take the time for check the very sophisticate ammunitions in their hands…and the origin of the mercenaries inside this army. AIN AL-BAIDA, SYRIA – The Turkish flag flies next to the green, white, and black standard of the Syrian revolution at a Free Syrian Army (FSA) position above the village of Ain al-Baida. Here, about 150 rebel fighters — mostly defectors from the Syrian Army — are situated in concrete and cinderblock houses pockmarked by bullet holes, their weapons pointed across the valley at the Syrian military below. Ain al-Baida is just across the border from Turkey, in Syria’s Idlib governorate. The village is not much more than a small cluster of buildings in a wide valley surrounded by wooded hills. The FSA has spread out across the north of Syria, making it difficult for Syrian security forces to control areas outside the major cities, such as Aleppo. Syrian President Bashar al-Assad’s brutal crackdown on protesters — over 40,000 Syrians have been killed, according to the United Nations — has provoked a growing armed resistance to his rule. These insurgents, comprised of defected army soldiers and outraged citizens, are building their military strength from a sliver of territory within Syria. They also rely on an impressive network of supporters inside Turkey to ferry supplies into Syria, deliver messages for senior FSA commanders, and transport wounded fighters and fleeing refugees out of the country. Turkey annonced additional sanctions on Syria, including a 30 percent tax on goods arriving from the country. For the past several days, Syria has blocked Turkish trucks (since the beginning of civil war) from entering, forcing Turkey to look for alternative routes for trade with the Middle East. Though the FSA claims to be composed of defectors from the Syrian military, this man said he was a civilian volunteer from the town of Jisr al-Shughour, which had been demolished this summer by the Syrian army’s Fourth Armored Division, under the control of the president’s brother, Maher Assad. 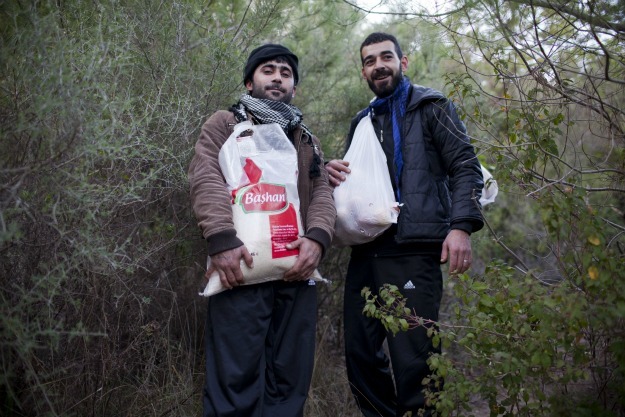 Nassr and Ashik are among tens of smugglers who cross the border several times a week, carrying food, medical supplies, clothes, satellite phones, and computer equipment. They also serve as guides for refugees and carry the wounded on their backs. Once they are near the Turkish border, they call ambulances or Turkish gendarmes to transport the wounded to a hospital, disappearing back into the trees as the Turks arrive. In a small flat in Antakya, a 26-year-old man from Damascus, who gives his name as Udai Sayeed, sits in a room full of laptops connected to the Internet by USB modems and talks to contacts on Skype. He and his band of opposition activists — which include a defected soldier, a former businessman from Jisr al-Shughour, and his nephew — purchase and transport supplies for the FSA and also civilians who lack food and medical supplies, such as bags for blood to be used in make-shift hospitals. Sometimes he has moved as much as $8,000 worth of supplies to the border at a time, Nazir claimed. « When you organize yourself, you will win, » he said. He claimed to prefer fighting on the front lines with the FSA, « as a soldier with a new ID. » (When soldiers defect they show their Syrian military IDs as proof.) Nazir said that the FSA aimed to keep the fighting at a « professional » level, preventing it from disintegrating from the anarchy seen in Libya or Iraq. « Yes, if I die you need to give my family money and the ID, like a hero, » he said, claiming that many Syrians living around the border area and in refugees camps are waiting for Asaad, the FSA commander, to call them to fight. Few of the fighters agreed to be photographed without scarves covering their faces. This was not out of concern for their security, Mohammad explained. Rather, in the past months of rough living, many of the fighters had grown beards. Indeed, Mohammad’s beard was much fuller than the whiskers I’d seen on his face when we first met in Guvecci, a Turkish village along the border he had initially fled to in June. After a long discussion about the photos and their possible implications, the fighters seemed relieved to hear that I understood having a beard in the Middle East did not necessarily mean someone was a fundamentalist. The raised their arms and shouted « Allahu Akbar! » when one of them spoke of overthrowing Assad, but hardly came across as Islamists. Again denying all reports of arms smuggling from Turkey, Mohammad said the FSA had a gun for every man, some taken from the Syrian military. They wanted to be supplied with arms, but were not receiving any from abroad, he claimed. « God will help us fight Bashar Assad if no one helps us, » he said. What Mohammad seemed to want, even more than weapons, was an internationally established buffer zone and no-fly zone inside Syria. « Many people from other cities can come to stay [there], or wounded can go to Turkey, » he said. Abdul Satar Yunsu, the FSA commander of the Hamza Khatib Brigade, laid out three possible locations for a buffer zone: In Deraa, near the Jordanian border; in Deir al-Zour, near the Iraqi border; and in Idlib, along the border with Turkey. Of all these options, however, the buffer zone along the Turkish border seems the most plausible. Turkey is not yet leading the international charge into Syria. 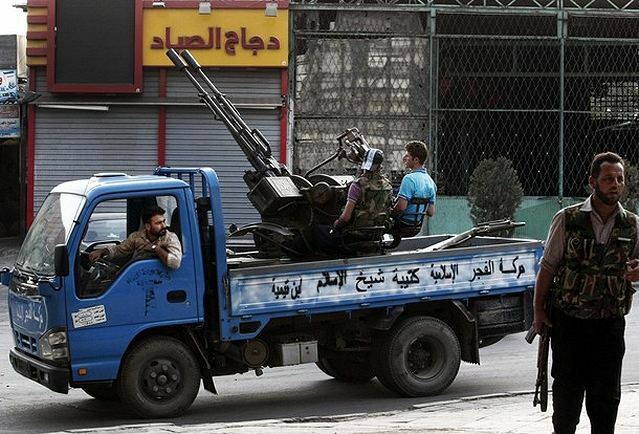 But the FSA might just carry its flag further south in the coming months. 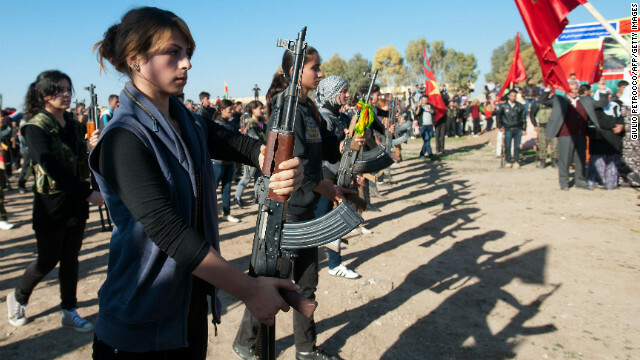 Young women from kurdhistan are serving now in the Al Qaïda left wing groups in syria…supporting Free Syrian army. 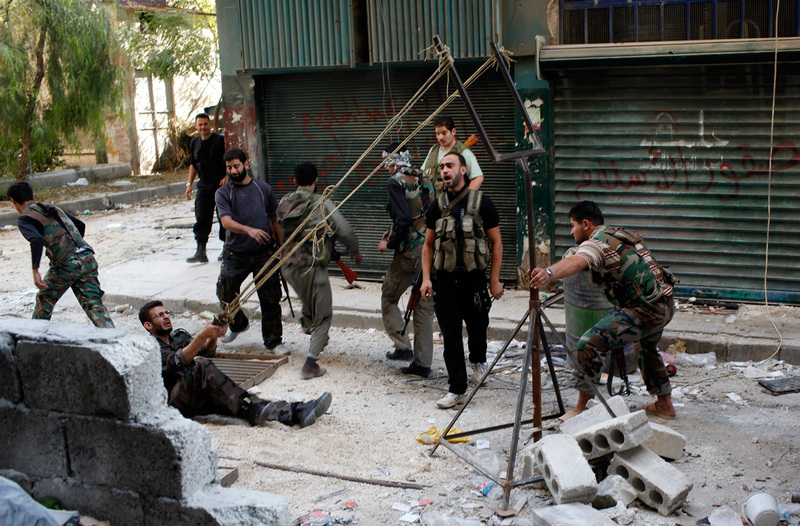 Free Syrian Army fighters unit in training camp…somewhere in Lebanon. In Damas,the Free Syrian Army fighters pray Allah just before the fights. 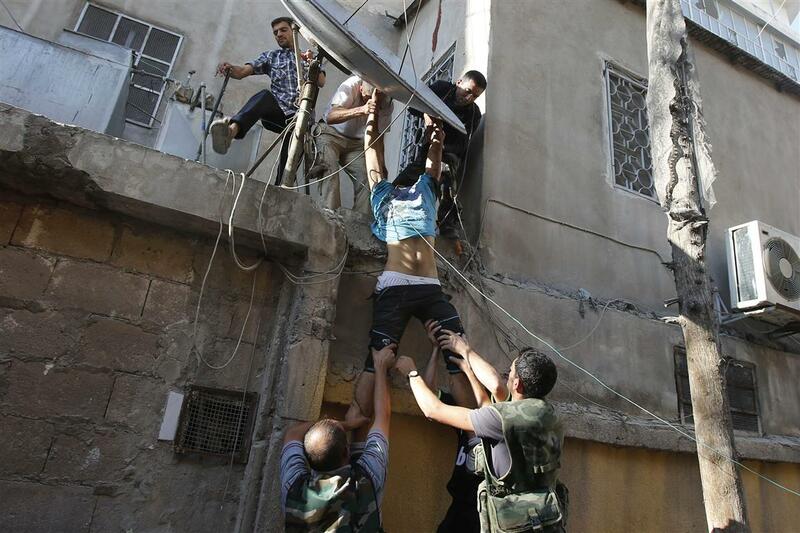 Soime Free Syrian Army drag a dead man out a building recently invest by them,in Damas. 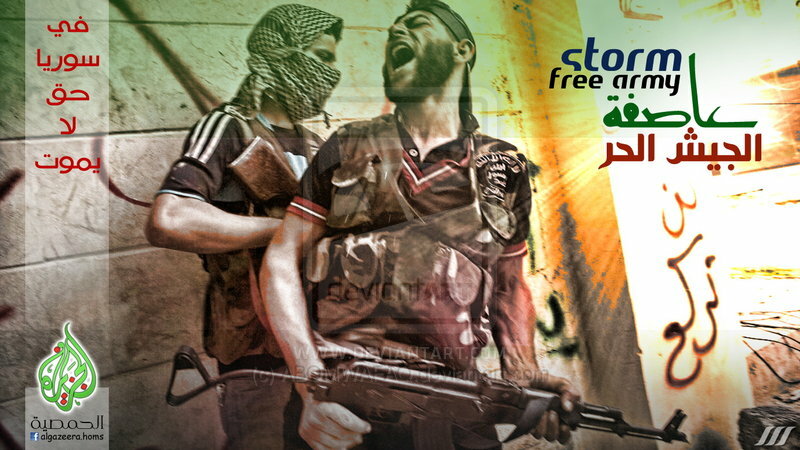 Propaganda from Al Jazeira for support the Al Qaeda mercenary forces in the Free Syrian Army. You know the brand new network in USA. The New World Order is ready to invade Syria ,now!